A soft and cozy sweater for weekend with tie back closures. Available in heathered gray or denim blue. Our luxe velvet tunic can be worn from day to evening and features a cross over open back that can be with or without a cami. 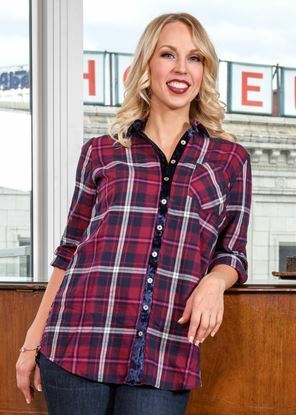 Our updated version of the classic plaid shirt features velvet trim accents and a coordinating print on the back. Get ready for compliments!